The drug 5-fluorouracil (5-FU) has been administered in the neoadjuvant, adjuvant, and metastatic settings across multiple cancer types for more than 50 years. Foremost, since the 1990s, fluorouracil has been the backbone of colorectal cancer regimens after demonstrating reductions in recurrence and mortality by 41% and 33%, respectively.1 Currently, patients with colorectal cancer receiving adjuvant treatment have the options of 5-FU or capecitabine as first-line treatment.2 The choice of one over the other is related to patient-specific factors, such as preference, cost, and tolerability. Although administration and toxicity may differ between the 2 agents, they share the same risks for early-onset toxicity and overdosage, the signs of which are easily dismissed by patients and providers as expected chemotherapy-related adverse events. Compared with many other cytotoxic chemotherapies, 5-FU and capecitabine are better tolerated, with manageable side-effect profiles. Rarely is drug discontinuation warranted, although dose reductions may be necessary to continue treatment. The common side effects of diarrhea and nausea typically occur within a 7- to 10-day window after initial dosing. Dermatologic toxicities, such as hand-foot syndrome, are more likely to present 6 weeks into treatment. In studies comparing 5-FU with capecitabine, patients receiving capecitabine were more likely to experience dermatologic toxicities, whereas 5-FU administration was more likely to result in diarrhea, mucositis, and neutropenia. Side effects associated with capecitabine use were also delayed compared with those associated with 5-FU use.3 Toxicities above grade 3 can occur with 5-FU and capecitabine but typically appear beyond cycle 2 of treatment. Approximately 30% of patients will experience toxicities above grade 3, and approximately 10% to 20% will require hospitalization to treat these toxicities.4 These patients may go on to continue 5-FU dosing after recovery. However, grade 3 or 4 toxicities occurring during or shortly after the first or second treatment cycle warrant temporary drug discontinuation and prompt investigation. Although the majority of patients tolerate 5-FU and capecitabine, there is a subset of the oncology population that will suffer from acute early-onset toxicity due to overexposure. Metabolic deficiencies or impairments in renal function can impair clearance of 5-FU and lead to acute toxicity after initial exposure to 5-FU or capecitabine.5 The associated acute toxicities will present soon after 5-FU administration, usually during or within 4 days of dosing, and will be grade 3 or higher. Typically, gastrointestinal side effects present early, with hematologic side effects following. It is important to remember that the less frequently occurring side effects of 5-FU and capecitabine, such as neurotoxicity and cardiac toxicity, may present acutely. Similarly, patients experiencing an overdosage of 5-FU or capecitabine will present with early grade 3 or 4 toxicities. Although presentation may not occur until 2 to 3 days after the overdosage event, treatment should be initiated when the overdosage is discovered and not when symptoms appear. Prompt recognition and treatment of these events is imperative for patient survival. Before the approval of uridine triacetate, supportive care was the only option for the treatment of 5-FU overexposure resulting in acute early-onset toxicity or overdosage. Supportive care measures were aimed at reducing overexposure sequelae and did not target the underlying mechanism. Frequently, with only supportive care, the end result of 5-FU overexposure was death.6 In cases where death does not occur, many patients experience such severe deconditioning from the toxicity that further chemotherapy treatment is not appropriate. However, when used within the recommended time frame, uridine triacetate not only improves overall survival following 5-FU overexposure but also allows a majority of patients to continue their cancer treatment after recovery. The 2 open-label clinical trials investigating uridine triacetate reflected the real-world population at risk for 5-FU overexposure, enrolling 173 adult and pediatric patients experiencing early-onset toxicity or overdosage from 5-FU or capecitabine.7 Of the 26 patients who experienced early-onset toxicity, 18 made a full recovery after receiving uridine triacetate within 96 hours of the last dose of 5-FU or capecitabine. The patients who did not recover received uridine triacetate outside of the recommended 96-hour window, reinforcing the importance of early recognition and prompt treatment of this patient population. In patients experiencing an overdose of 5-FU or capecitabine, 96% of patients survived when uridine triacetate was administered within 96 hours as well, a drastically higher percentage than the survival rates noted in the US Food and Drug Administration MAUDE database. These results assert the safety and efficacy of using uridine triacetate in a patient population for which no other effective treatment options are available. Uridine triacetate is known to be effective when used within 96 hours of the last known dose of 5-FU or capecitabine. The 96-hour time frame highlights the importance of educating patients, caregivers, and providers on recognizing and understanding the pathophysiology of early-onset toxicity. This provides an ideal opportunity for pharmacists to have a dialogue with patients regarding the range of side effects associated with these agents. All too often patients are confused as to what side effects warrant notifying their provider. Patients should be educated that toxicity above grade 2 requires further investigation before continued dosing of 5-FU or capecitabine, and they should be encouraged to notify their provider in such circumstances. Acute early-onset toxicity is a clinical diagnosis, and providers need to recognize these symptoms apart from typical side effects. When investigating a patient complaint of toxicity, it is important to know when the 5-FU or capecitabine dosing cycle started, when toxicities presented, and when the last dose was administered. This assessment should not be limited to providers but also to infusion pharmacists and nurses who may see 5-FU patients more frequently during treatment and are able to initiate quick interventions. Finally, we need to remember that many patients will present to the emergency department with 5-FU overexposure before notifying their oncologist. It is important that emergency department physicians, nurses, and pharmacists be educated about the presentation of 5-FU overexposure and the need to initiate the antidote uridine triacetate within a short window of time. Having a clear treatment pathway for 5-FU overexposure built into institutional guidelines can prevent a potentially lethal delay in care. Dosing of 5-FU and capecitabine is widespread in oncology treatment plans. Although they are well tolerated overall, these agents are not benign and can cause irreversible harm to patients if toxicities are not recognized and treatment initiated promptly. With the approval of uridine triacetate, patients who present with early-onset toxicity or overdosage of 5-FU or capecitabine have a 97% chance of survival and increased likelihood to continue cancer treatment after recovery. 1. Moertel CG, Fleming TR, MacDonald JS, et al. Levamisole and fluorouracil as adjuvant therapy of resected colon carcinoma. N Engl J Med. 1990;322:352-358. 2. National Comprehensive Cancer Network. Clinical Practice Guidelines in Oncology (NCCN Guidelines®): Colon Cancer. Version 2.2017. www.nccn.org/professionals/physician_gls/pdf/colon.pdf. Published March 13, 2017. Accessed July 18, 2017. 3. Twelves C, Wong A, Nowacki MP, et al. Capecitabine as adjuvant treatment for stage III colon cancer. N Engl J Med. 2005;352:2696-2704. 4. Meulendijks D, Cats A, Beijnen JH, Schellens JH. 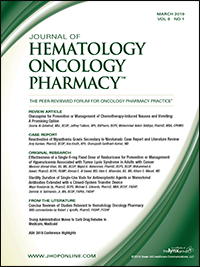 Improving safety of fluoropyrimidine chemotherapy by individualizing treatment based on dihydropyrimidine dehydrogenase activity – Ready for clinical practice? Cancer Treat Rev. 2016;50:23-34. 5. Lam SW, Guchelaar HJ, Boven E. The role of pharmacogenetics in capecitabine efficacy and toxicity. Cancer Treat Rev. 2016;50:9-22. 6. Ison G, Beaver JA, McGuinn WE Jr, et al. FDA approval: uridine triacetate for the treatment of patients following fluorouracil or capecitabine overdose or exhibiting early-onset severe toxicities following administration of these drugs. Clin Cancer Res. 2016;22:4545-4549. 7. Ma WW, Saif MW, El-Rayes BF, et al. Emergency use of uridine triacetate for the prevention and treatment of life-threatening 5-fluorouracil and capecitabine toxicity. Cancer. 2017;123:345-356. 8. Institute for Safe Medication Practices. 2016-2017 Targeted Medication Safety Best Practices for Hospitals. www.ismp.org/tools/bestpractices/TMSBP-for-Hospitals.pdf. Accessed August 17, 2017. 9. Dart RC, Goldfrank LR, Erstad BL, et al. Expert Consensus Guidelines for stocking of antidotes in hospitals that provide emergency care. Ann Emerg Med. 2017 Jun 29. pii:S0196-0644(17)30657-1. doi:10.1016/j.annemergmed.2017.05.021. [Epub ahead of print].